UPDATE : 16/11/2017 : WE HAVE RECENTLY TRIED TO ORDER MORE OF THESE FROM OUR SUPPLIER BUT THEY DO NOT HAVE ANY AND CANNOT SAY FOR SURE WHEN THEY WILL HAVE MORE, SO FOR THE MOMENT AT LEAST, THIS AERIAL IS CURRENTLY UNAVAILABLE, SORRY! 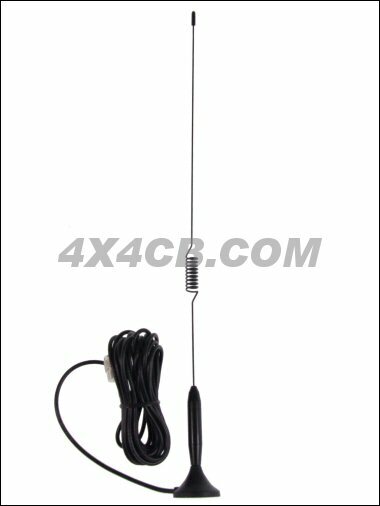 A unique magnetic mount aerial, very thin and short and with a magnet about the size of a £2 coin! Fairly limited range (1-3 miles) but it's very subtle indeed - looks more like a mobile phone aerial although as it's so thin and small most people wouldn't even notice it!